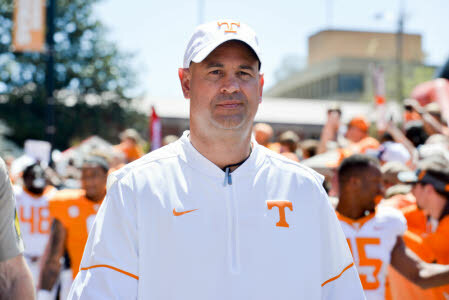 Tennessee head coach Jeremy Pruitt participates in his first Vol Walk prior to Saturday's Orange and White game. 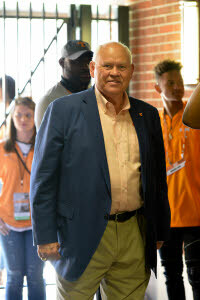 Tennessee Athletic Director Phil Fulmer enters Neyland Stadium. 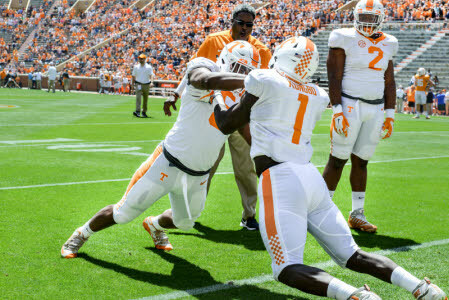 Defensive lineman Jonathan Kongbo (1) goes through a pre-game drill with Kyle Phillips as Shy Tuttle (2) watches. 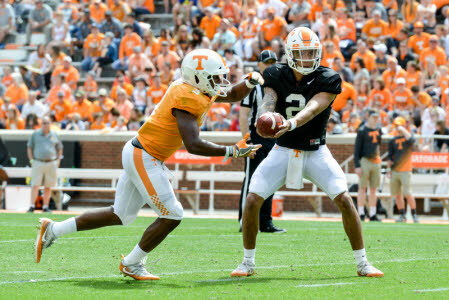 Quarterback Jarrett Guarantano (2) hands off to Ty Chandler. 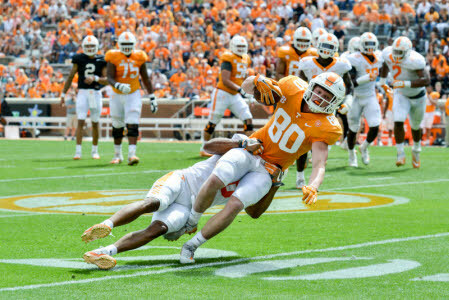 Tight end Eli Wolf (80) is brought down after a pass reception. 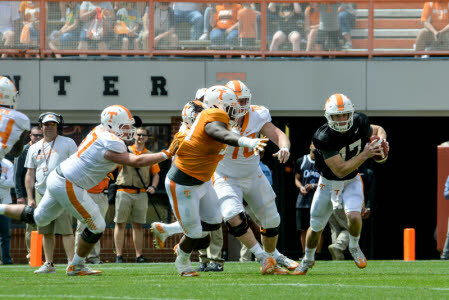 Quarterback Will McBride (17) sets to pass as Ryan Thaxton (44) attempts to elude his blocker. 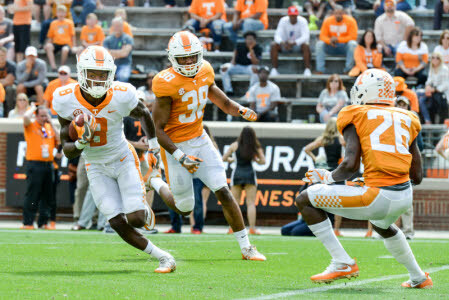 Wide receiver Latrell Williams (8) looks for running room as linebacker Solon Page II (38) and defensive back Theo Jackson (26) close in to make the tackle. 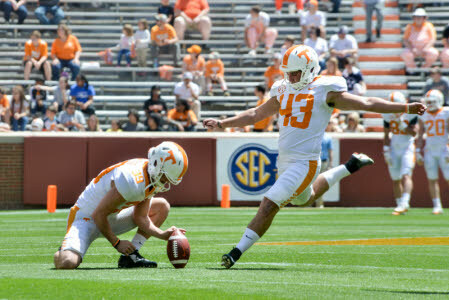 Former Ooltewah High School kicker Laszlo Toser (43) sets to kick a PAT out of the hold of Grayson Pontius. 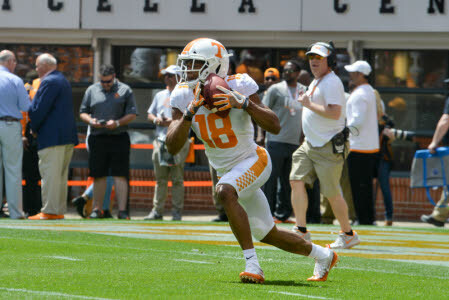 Nigel Warrior returns a kickoff. 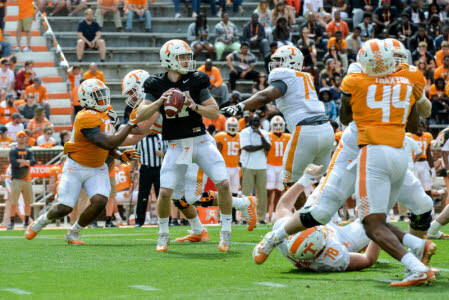 Quarterback Will mcBride (17) sprints out of the backfield as his White team blockers pick up a rusher. 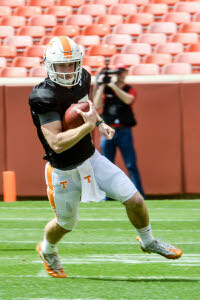 Will McBride carries the ball during Saturday's Orange and White game. 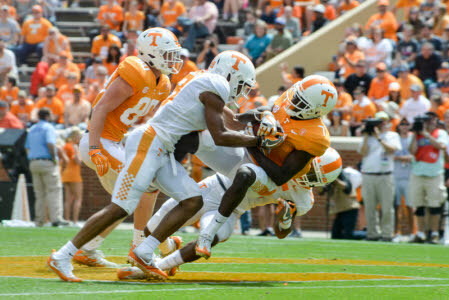 Baylen Buchanan, in white, attempts to strip the ball from Orange receiver Brandon Johnson, right. 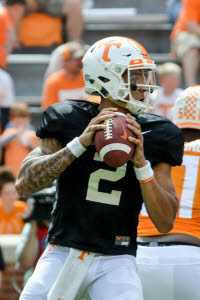 Quarterback Jarrett Guarantano looks for a receiver.